The loss of jobs and talent, the uncertainty of retraining efforts, and the possibility of large population shifts in rural and urban communities as workers relocate were the top concerns according to those who spoke to Western Wire. AGNC represents Mesa, Garfield, Rio Blanco, Moffat, Grand and Routt counties and their municipalities, along with the cities of Montrose and Delta. Polis promised a “fair” shake to the state’s energy workers in coal, oil and gas, as he pushed policies that encouraged renewable energy development—including the 100 percent renewable energy goal by 2040—at the expense of traditional natural resources. Parts of Colorado have begun to glimpse that future. Shutting down coal mining and coal-powered electric generation, as seen in Moffat County, has led to a decline in employment, Petersen said. Petersen noted that Moffat County was one of the counties designated as distressed by the Economic Development Administration at the Department of Commerce last year. “NW Colorado counties have not recovered from the 2008 recession and Moffat County seems to be declining as jobs are not replaced in preparation for the scheduled close of Unit 1 of the Craig Station power plant in 2025,” she said. Policies intended to promote renewable energy—and the jobs that accompany them—have failed in northwest Colorado, Petersen said. The promise of a “just transition” from current, well-paid jobs in natural resource development has not materialized, Petersen continued. “We agree that the energy workforce of today are some of the hardest working people in Colorado and if government is going to force the loss of their jobs and the economic sustainability of their communities then there should be opportunities available to help with a transition – we haven’t seen that in rural Colorado,” Petersen said. Rural communities such as those in Moffat County don’t have reliable, well-paid job alternatives waiting for them, and what service jobs there are pay only a fraction of what the workers receive as energy workers, according to Petersen. “[T]hat is not helpful for the workers, their families, the communities, the school districts or the other businesses in the area,” she said. Ray Beck, Chairman of AGNC and a Moffat County Commissioner and former Mayor of Craig, Colo. agreed, inviting the governor to visit his county and take a tour of Craig Generating Station. Tri-Sate Generation and Transmission operates in parts of rural Colorado and three other states. “This community has for years relied on our energy sector, and so when we think about transitioning over to renewables by 2040, that is very concerning for Moffat County,” said Beck. “My message to the governor is that, with all due respect… his call for building and fostering relationships, whether it be him coming to our counties or us going over to the state capitol to meet with him, I would like to take him up on that offer,” Beck said, inviting Polis to share his ideas on transitioning from coal-based economies. Beck also worried about impacts to local tax revenues from energy producers and economic dislocation as residents abandon counties like his for better economic opportunities elsewhere. “Property tax is our largest revenue source,” Beck said. “This is really concerning for us.” Budgets would be immediately impacted, he added. Gary Arnold, business manager for Denver Pipefitters Local 208 and a vocal opponent of last year’s Proposition 112 2,500-foot setback measure told Western Wire he was cautiously optimistic but still concerned about oil and gas workers having a seat at the table in policy discussions. “I believe that most Coloradan’s understand the challenges climate change will present to our state, but those same Coloradan’s understand that we can’t just abandon an entire industry supporting so many middle-class workers,” Arnold said. He added that he was encouraged by Polis’ acknowledgement during the Governor’s State of the State address and the commitment that “workers in the current Coal/Oil/Gas industries will be at the table when developing future energy policy.” He said this was an improvement on the process unlike Proposition 112, which sought to exclude workers and businesses in the industry. Arnold said that any policy option must ensure adequate resources for worker transitioning to other energy development. 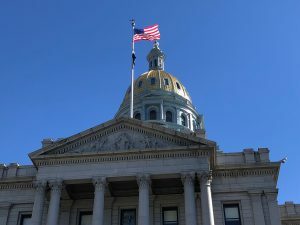 “The goal now must shift to embracing the best technology available now and in the future (including carbon capture, geothermal, and other clean energy processes), and providing worker transition programs that ensure residents employed in the oil/gas/coal industry continue to be part of Colorado’s strong middle class,” Arnold said. Besides money, Arnold continued, adequate time to make the policy shift should be a “priority” for legislators. “An energy policy embracing all resources available, is well planned, and provides a long enough timeline for proper implementation should be our priority,” he said. Arnold served on Polis’ transition team, working to identify and hire candidates for the Colorado Department of Labor and Employment and the Office of Economic Development and International Trade. “It’s not good. When people say, ‘we want to retrain,’ that means relocate,” Cooke said. 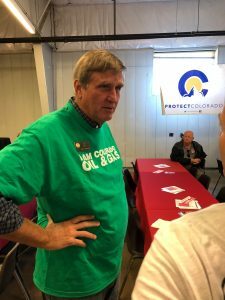 Relocation of high-paying jobs to neighboring states, Cooke said, as well-paid workers flee for better economic opportunity, would drain places like Weld County, where more than 90 percent of the state’s oil production and approximately 40 percent of natural gas production occurs. He cited states like Oklahoma and especially Texas and New Mexico, where oil production in the Permian Basin was booming. “Why would these high-paying jobs for people working in the oil and gas industry take huge cuts to be retrained?” Cooke asked. Local governments stand to lose revenues from falling a falling tax base as workers leave, housing prices plummet, and property and severance taxes directly and indirectly related to oil and gas production disappear—something that deeply troubles Cooke, who represents portions of Weld County. Cooke said Republicans in the General Assembly are taking a “wait-and-see” approach to legislation this session, but hopes to defeat any more extreme bill proposals, like moratoria on all oil and gas operations, or any push for a setback measure similar to the one defeated in November by ten points. Democrats hold a 19-16 seat majority in the State Senate. Cooke hopes that at the very least, Senate Republicans can mitigate adverse impacts from the more aggressive bills he expected Democrats to introduce.